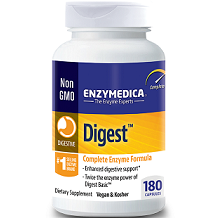 Enzymedica Digest is a dietary supplement that was formulated specifically for enhancing and improving the digestive system. The supplement contains an enhanced enzyme formula that breaks down carbohydrates, fats, fiber and protein. Probiotics provide additional digestive support by boosting enzyme production and promoting regularity. This product is supposed to help your body absorb nutrients and convert food into energy while diminishing the range of symptoms often associated with IBS like bloating, stomach pain, constipation and gas. These ingredients help to improve digestion, providing more energy, stress-monitoring and can help to fight diabetes. The inactive ingredients in the product are cellulose and water. The product does not contain eggs, dairy, preservatives, salt, soy, wheat, nuts, gluten or potato. Take 1 or more capsules with each meal. The manufacturer does not mention the frequency of the dose, or whether best to take the capsule in the morning or evening. On the manufacturer’s website, the cost for 30 capsules is $11.99. If you subscribe to a recurring order, you can get a 20% discount. Shipping is an extra cost. There are no additional discounts for first time customers nor bulk buyers. A full refund is offered for any reason within 30 days of purchase. A refund will be issued for the original purchase price of the product, minus any applicable shipping and handling charges. It’s not clear if the refund also includes open bottles of pills. The product does not contain eggs, dairy, preservatives, salt, soy, wheat, nuts, gluten or potato. It is also free from and is suitable for vegetarians and is kosher, as well as non-GMO. Enzymedica does not use ingredients produced using biotechnology. The company honors a refund policy that enables you to request a full refund for any reason within 30 days of purchase minus any applicable shipping and handling charges. If you subscribe to a recurring order, you can get a 20% discount.These are some of the good things about the product but we have some criticisms too. The manufacturer says to take one pill before a meal but doesn’t mentioned if this is for daily intake, or whether best to take the capsule in the morning or evening. There are no additional discounts for first time customers nor bulk buyers. The manufacturer has not included shipping costs in the purchase price. Although a guarantee is welcomed, the consumer has only 30-days to return the product after purchase and will incur the shipping costs and (unspecified) handling charges. We felt there was a complete lack of explanation regarding possible side effects. Our own research showed us that there can be many types of side effects including stomach pain, headache, gas, constipation, cough, sore throat, diarrhea, upset stomach. This being the case we feel the manufacturer should have explained these. In the reviews we read we saw some many negative reviews from people experiencing these same side effects. 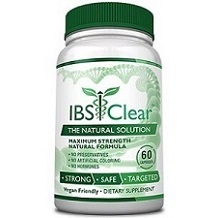 We suggest you find an IBS supplement that minimizes side effects and extends a clearer explanation of dosage and treatment plan.